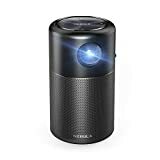 If you’re looking for a new portable pico projector and you don’t want to go with a cheapo model that’s barely bright enough to see even in pitch black darkness, you’ve got to check out the Nebula Capsule Smart Mini Projector by Anker. It works with iPhones, iPads, and Android devices, and it has built-in 360° sound so you don’t have to deal with your phone’s crummy audio. It’s also on sale for $72 off if you use the coupon code 2CAPSULE at checkout on Amazon, making it way less expensive than comparable projectors that are nowhere near as good.